The EOS Rebel 77D DSLR Camera (Body Only) from Canon is a lightweight APS-C format digital SLR camera with an 24.2MP CMOS sensor and the DIGIC 7 image processor. It provides sharp details, accurate colors and low-noise imaging in compact form factor with an easy to use interface. Built-In Wi-Fi Connectivity with NFC Bluetooth. A 9-point autofocus system provides fast focusing when shooting with the viewfinder and Hybrid CMOS AF II increases autofocus speed and accuracy when shooting in Live View. 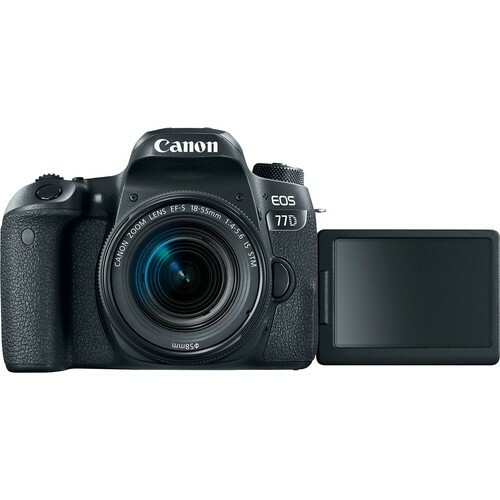 The Rebel 77D can continuously shoot up to 5 fps, and its wide ISO range of 100-12800 (expandable to 25600) allows for confident shooting in bright and low light situations. 3.0" 1.04m-dot Vari-Angle Touchscreen. Smudge-resistant coating keeps the monitor clear, even in bright sunlight. An optical viewfinder with 0.87x magnification is also available for stable eye-level composition.Full HD 1080p at 30 fps and 24 fps is supported with Movie Servo for continuous autofocus during shooting. 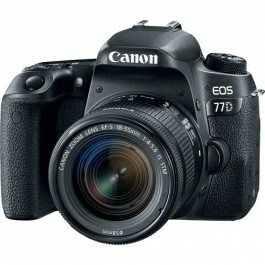 Manual exposure is provided in video mode and 60 fps is possible when shooting at 720p HD. A built-in mono microphone with manual audio level adjustment is provided, and Video Snapshot with editing is supported.